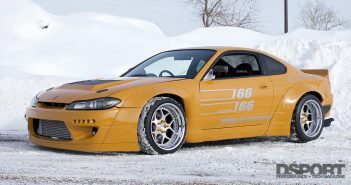 In the first Test and Tune segment, our 2001 Nissan Silvia S15 illustrated how much of a difference quality aftermarket components would make to a turbocharged engine. The Tanabe Concept G Blue turbo-back exhaust system reduced exhaust restrictions and also increased boost pressure. The value of fuel tuning was clearly shown in the results that were recorded. In the capable hands of XS Engineering’s Koji Arai, the A’PEXi Power FC engine- management system and Power Enterprise fuel injectors ensured adequate fuel delivery for the additional boost pressure. 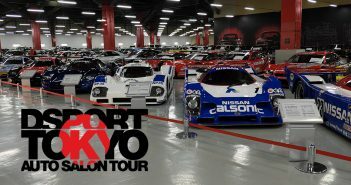 With the engine management and exhaust components in place, a total of 32.6 wheel horsepower was realized at the end of the tuning session. For this installment, the quest for horsepower continued. We tested a Blitz LM front-mount intercooler, A’PEXi Super Suction Kit and the Tanabe Concept G Blue exhaust system cat-delete pipe. The factory issued intercooler on the S15 is a side-mount. This configuration positions the intercooler neatly beneath the headlight in front of the left tire. Although this position permits uninhibited airflow to the condenser and the radiator core, the size of the intercooler is restricted to that of a phone book. For stock power, this is sufficient. For higher-power levels, the factory intercooler cannot draw enough heat away from the compressed air generated by the turbocharger. To remedy the situation, we turned to Blitz USA. 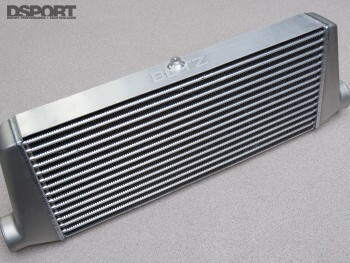 The Blitz LM front-mount intercooler has been hailed as one of the most efficient intercoolers on the market. The Blitz LM intercooler kit for the S15 (p/n:12333) comes complete with aluminum piping, hose clamps, silicone hose couplers, battery terminal extensions and mounting hardware. 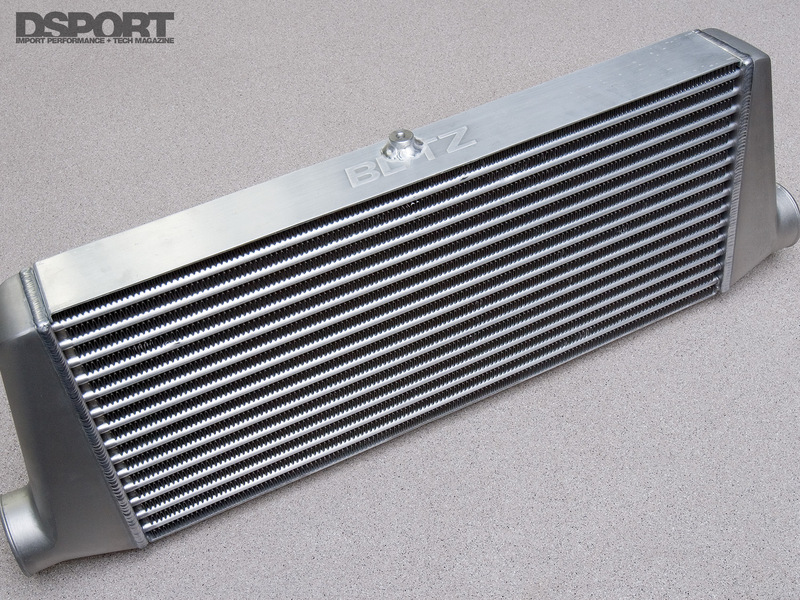 Boasting a “Tube and Fin” core design, Blitz aluminum intercoolers have exhibited as little as 0.71psi of pressure drop at 17psi of boost pressure while effectively lowering intake air temperatures. Installing the intercooler is straight forward but requires some trimming of the bumper cover and a hole to be cut into the battery tray. The included battery terminal extensions make the installation of a smaller battery a snap. The other option is to relocate the battery to the trunk area. 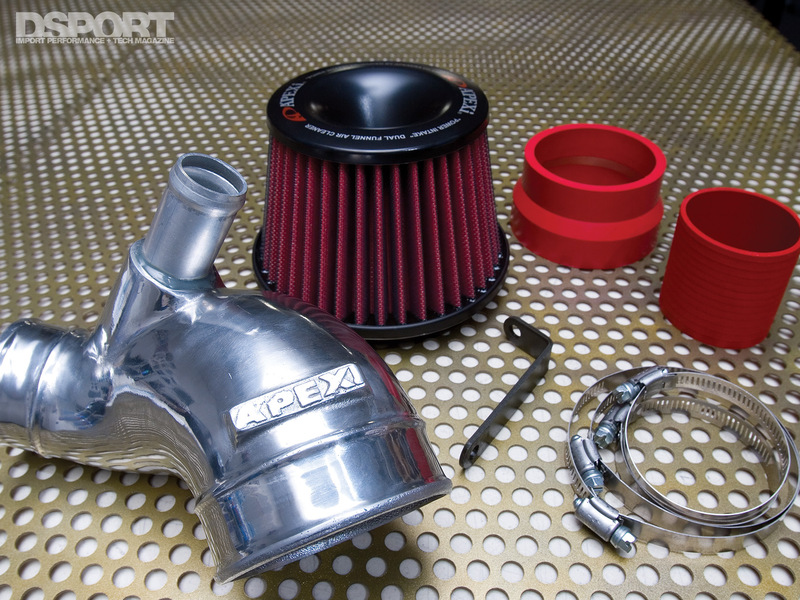 Once the intercooler was in place, the boost was safely increased to 18psi (1.25bar). The high-efficiency design of the intercooler coupled with a superior front-mount location will allow this chiller to be effective when producing twice the stock engine horsepower. 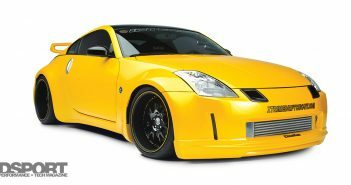 When we installed the Blitz front mount, we also fitted a Blitz hot pipe with Super Sound Dual-Drive Blow-Off valve (p/n 70023) which eliminates the factory bypass valve and is capable of handling greater boost levels. Since we converted the Silvia to speed density, it made sense to open up the intake system by removing the now defunct MAF sensor from the intake pipe. In its place, we selected an A’PEXi Super Suction kit. The Super Suction kit features a polished, cast pipe which is not susceptible to collapsing like the factory rubber hose. The hard pipe has an adapter for 80mm MAF sensors (like the Z32) or can be adapted to bypass the MAF sensor (in the case of a speed density system.) With the MAF sensor out of the way, the turbocharger should be able to ingest air without any restriction. This intake installed without a hitch, allowing us to remove the restrictive stock MAF sensor and sensor housing. 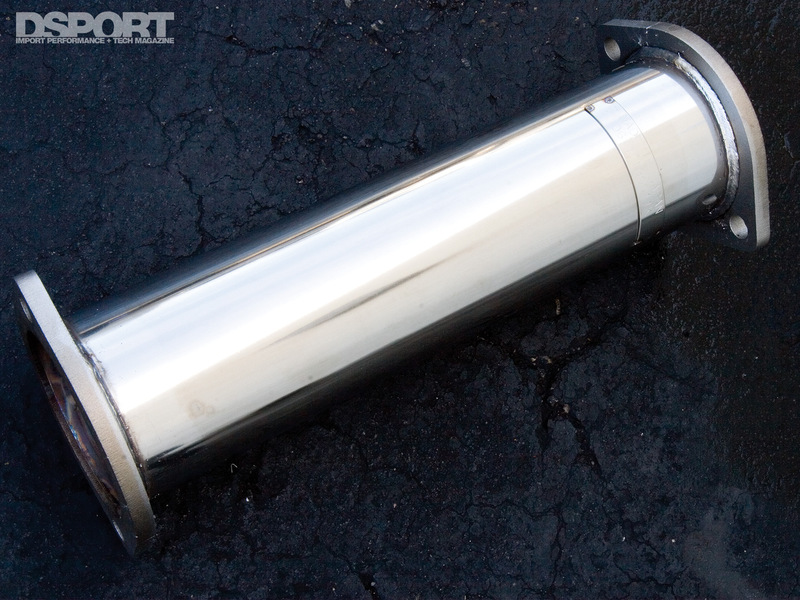 Since we already upgraded the cat-back exhaust and downpipe, the catalytic converter was the last restriction in the exhaust plumbing that could inhibit power production. The final component for this Test-and-Tune session is the cat-delete pipe included with the Tanabe Medalion Concept G Blue exhaust system. This part is designed for “racing use only” since it removes an emissions device from the vehicle.